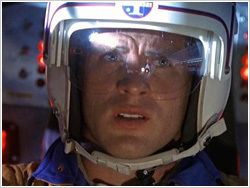 When astronaut John Crichton accidentally flies into a wormhole during a research mission, he is thrown in the middle of a space battle between the Peacekeepers and a group of escaped prisoners. John finds himself face to face with aliens for the first time when the prisoners pull him aboard Moya, their sentient ship, also known as a Leviathan. To escape from the Peacekeepers, Pilot engages Moya in a starburst that places them somewhere in Unchartered Territories. One of the Peacekeepers' Prowlers is pulled along with Moya, making Officer Aeryn Sun an unexpected traveller on the journey. 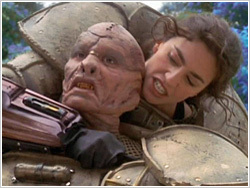 As the group travels through Uncharted Territories, their task of returning home is complicated by Bialar Crais who chases them in an attempt to recapture Moya and the prisoners, execute Aeryn for her extended contact with the aliens and seek revenge on Crichton for the accidental death of Crais' brother. A locator beacon, automatically broadcasting its exact location to any Peacekeeper forces in the area, is discovered inextricably fused into Moya's neural nexus. Pilot lands her on a nearby planet and immerses the ship in a giant swamp to muffle the signal while the crew attempts to remove the beacon. John, Aeryn and D'Argo leave Moya to explore the planet in hopes of locating Clorium, a substance that will serve as an anaesthetic for the procedure. In a confrontation with the inhabitants of the planet, the group finds that only one female, Lyneea, is willing to help them. In the meantime, Zhaan and Rygel attempt the painful surgery. However, complications arise and Pilot struggles to keep Moya alive until the Clorium arrives. In an attempt to hide from one of Crais' scout ships, Moya takes refuge behind an apparent cloud of asteroid debris, only to discover that the debris is actually a swarm of alien life forms, the Draks. These aliens board the ship, create replicants of Crichton, D'Argo, Aeryn and Zhaan and eventually take over Maya to create a favourable environment in which to breed. When one of the Draks inhabits Zhaan's body to communicate, Crichton is able to work out a truce with them. Meanwhile, Peacekeepers have invaded Moya and kill every Drak replicant in their path. Together with the Draks, Crichton works out a plan to fend off their mutual enemy. Rygel is kidnapped by a group of Tavlek soldiers after he steals Moya's propulsion processor in an attempt to look more prestigious while conducting business. 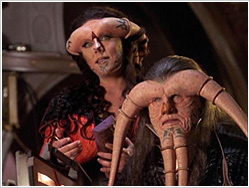 Unable to pay the ransom, Crichton, Aeryn and D'Argo go down to the Tavlek's planet to rescue Rygel and recover Moya's processor. However, while using weapons stolen from the Tavleks, the group experiences extremely violent, drug-induced impulses that cause them to attack each other instead of fighting their common enemy. Moya and her crew save two Ilanic aliens, an elderly scientist and his much younger female assistant from their disintegrating ship. During the rescue Crichton is exposed to a mysterious force that allows him to see images of possible future events, including the murders of D'Argo and the scientist. 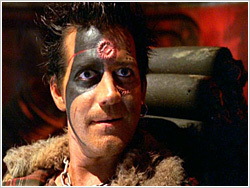 Crichton tries to change the present in order to affect the future, but his visions only become more and more violent, culminating in the images of destruction of Moya as well as his own death. During an excursion to the planet Skykar, D'Argo decides he no longer wants to travel on Moya, but become a harvester of Tannot root like all the drone-like inhabitants of the planet. While on the planet trying to convince D'Argo to return, Rygel ingests large quantities of the root, which causes all of his bodily fluids to become deadly explosives. 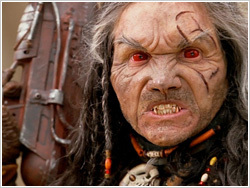 As Pilot and Aeryn try to cure Rygel before he inflicts irreparable damage on Moya, Crichton works to free both D'Argo and Zhaan from the effects of the Tannot root before the Skykarian leader enslaves them all and takes over Moya. Moya and her crew discover the remains of the Zelbinion, a Peacekeeper Command Carrier and the first ship Rygel was imprisoned and tortured upon. While exploring for any usable items on the ship, they come across Gilina, a Peacekeeper technician sent to salvage anything valuable by Crais. Crichton and Gilina find themselves attracted to one another, but must put their relationship on hold while the group works together to fend off a violent race of scavenger aliens known as the Sheyangs. While D'Argo and Zhaan stall for time, Crichton, Gilina and Aeryn race against the clock to get the Zelbinion's defence screen operational before they are attacked. 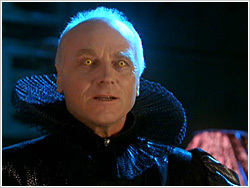 Following a man who offers to help him find his way home, Crichton's spirit is literally torn from his body when he enters the house of the evil sorcerer Maldis. Trapped in the great hall of Maldis' residence, Crichton's spirit is forced to fight Crais' spirit in a deadly game devised for the sorcerer's amusement. In an attempt to rescue Crichton, Zhaan joins forces with a local shaman who unlocks a dangerous side of Zhaan that she must deal with before she can save anyone else. NamTar, a geneticist known for his brutal but brilliant experiments, offers to provide star charts leading to the home worlds of D'Argo, Zhaan and Rygel in exchange for one of Pilot's four arms. However, when the charts are loaded into Moya, the data crystal overloads Moya's systems and all but one star chart must be removed to make Moya operational again. D'Argo, Zhaan and Rygel pit themselves against one another in a battle to decide which map stays. At the same time, Crichton battles NamTar to rescue Aeryn from the grasps of the evil scientist who has turned her into a host body for one of his deadly genetic experiments. An explosion throws D'Argo into space after he removes a Peacekeeper retaining shield from Moya. He is rescued by the rest of the crew, but begins experiencing hallucinations that cause him to believe that Rygel, Zhaan and Crichton are actually family members from his dark past. The explosion also released an unidentified substance into Moya which causes system-wide shut downs, including a feeding system for Pilot. When Pilot loses consciousness from malnutrition, it is up to the crew not only to take command of Moya but also to find the cause of the malfunctions and remedy the situation before they all perish. 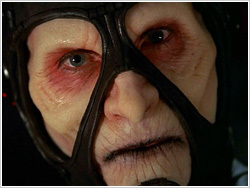 Written by Doug Heyes Jr.
Crichton and Aeryn are forced to land Farscape One on the planet Dam-Ba-Da after it suffers a plasma leak during a failed experiment. While there, they notice a Peacekeeper Beacon broadcasting rewards for the capture of D'Argo, Zhaan and Rygel. 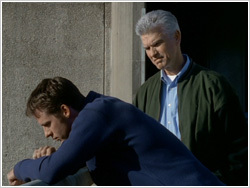 Several bounty hunters also take notice of the broadcast, forcing Crichton to impersonate a bounty hunter himself in order to ensure the safety of the rest of the crew. As additional bounty hunters join in the chase, the crew is in a desperate race to reach Moya and escape from Dam-Ba-Da before they are captured and returned to the Peacekeepers. When the entire group experiences strange and powerful dreams, Moya, imagining the distress cries of a pregnant Leviathan, starbursts without warning in search of the call. What Moya and the crew discover though is not a ship but a small colony of Delvian missionaries who followed their leader into the Uncharted Territories. In danger of becoming mad from their inability to handle their dark impulses, the missionaries beg Zhaan to help. But when she offers aid, she is taken advantage of and stripped of her own ability to manage her anger. 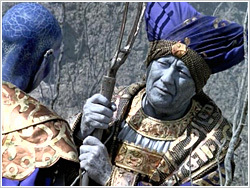 As the crew tries to save Zhaan, they are distracted by powerful hallucinations of their pasts, activated by the mind control of the missionaries. While learning some basic piloting manoeuvres from Aeryn in a transport pod, Crichton flies into the Flax, a large magna drift net set by Zenetan pirates who board and scavenge from any ship caught in their trap. The rest of the crew is alerted to their plight by a Zenetan defector who offers to guide D'Argo through the Flax. However, the guide navigates poorly and his craft is soon caught in the net as well. 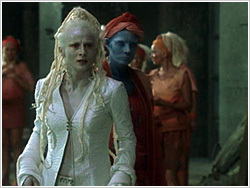 As the pirate commander searches for the defector, it is up to Zhaan and Rygel to distract him long enough for D'Argo and the defector to free their ship, rescue Aeryn and Crichton and return to Moya. 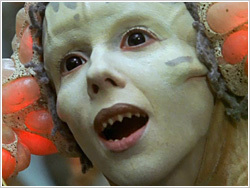 Crichton is left behind in Farscape One when Moya suddenly starbursts as a result of her pregnancy. When the crew finally locates Crichton on the planet Acquara, they find that he has adapted well within the culture found there. 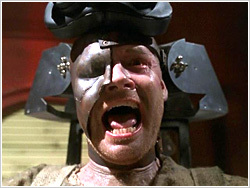 However, tensions arise when Crichton is pitted against an Acquarian man for the love of the ruler's daughter. It is up to Rygel, who is mistaken for a legendary Acquarian saviour, to get the crew back to the ship and escape from the planet before his true identity is discovered. When a pregnant Moya unexpectedly starbursts and collides with a Nebari transport, the crew feels obligated to make repairs and brings the vessel aboard Moya. Once docked, they find the ship carries a Nebari official, Salis, a Nebari criminal, Chiana, and Captain Durka, the man responsible for the torture of Rygel, who was thought to be dead. Seeking revenge, Rygel attempts to kill Durka, but instead, only releases the dark side of Durka's personality that had been contained by the Nebari. 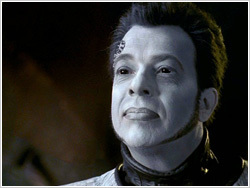 Shortly after Chiana escapes her holding cell, Salis is found dead and Durka captures both Rygel and Aeryn. The rest of the crew must find a way to stop Durka before he kills his hostages and takes over Moya completely. 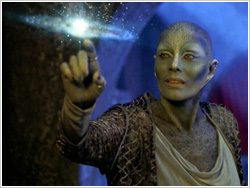 When Moya travels to an unstable wormhole that appears to lead to Earth, Crichton leaves on Farscape One in the hopes of returning home. His arrival back on earth, while successful, is not the welcome home he expected. People who were once his friends now distrust him for opening the still active wormhole. When Aeryn, Rygel and D'Argo suddenly appear on Earth, even Crichton's true identity is questioned. As his friends are imprisoned, Crichton realises that returning to Earth is not the homecoming he imagined and, in fact, could mean death to the friends who helped him return in the first place. In an effort to prove that her abilities to serve the crew and protect them from capture are not compromised during her pregnancy, Moya starbursts without warning and accidentally crashes into something when she runs out of energy mid-burst. 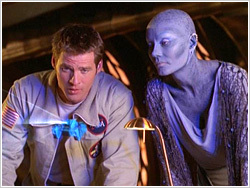 Crichton discovers that Moya has torn through the space-time seam and is wedged in the rift, fractured into four dimensions. In addition, Rygel, D'Argo and Aeryn have been placed in a different dimension from everyone else. 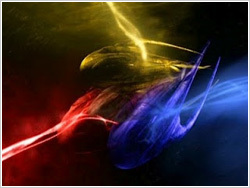 As the crew works to remove Moya from the rift, they must also battle alien intruders manifesting in each dimension who will go to any lengths to keep Moya from escaping. When Moya comes into contact with a damaged Peacekeeper ship en route to a secret mission, Crichton impersonates a Peacekeeper Captain transporting criminals and forms an uneasy relationship with the PK Commandos. When the PK crew commandeers Moya to finish their mission, a devastating virus is released onto the ship, immediately infects two Peacekeepers, causing death. To stop the virus from killing everyone on board as well as taking control of the galaxy, the Peacekeepers must work together with Crichton and his "prisoners" before time runs out. Moya and her crew follow Larraq's former flight path to a secret PK Gammak base, in search of a way to save Aeryn from a near-fatal injury. Reaching their destination, Crichton and Chiana successfully infiltrate the base and obtain what they need with the help of an old friend. 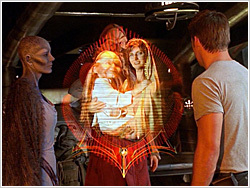 Crichton tries to return to Moya, but is captured by Scorpius, a hybrid Scarren-Sebacean. Crichton is trapped in Scorpius' Aurora Chair, an inquisition device where his memories are literally torn from his mind. While the crew works towards saving Crichton, Moya goes into labour, shutting down all of her propulsion systems. Aeryn, still recovering from her wounds, leads D'Argo and Zhaan to the PK Gammak base in an attempt to rescue Crichton from Scorpius. What the rescue team does not account for is the presence of Crais—contacted by Scorpius after uncovering Crichton's memories of their previous altercations. However, as Scorpius and Crais turn against one another, Crichton sees a chance to escape. At the same time, Moya's labour takes a dangerous turn when complications arise that could have deadly repercussions for the entire crew. Moya finds herself unable to navigate an asteroid field after she shuts down to avoid detection from Crais' Command Carrier. When the crew picks up a distress call from an asteroid within the field, they explore in hopes of finding someone who can help escape. Aeryn decides to stay aboard Moya to help the Leviathan bond with her baby and keep him from inadvertently forming an alliance with the nearby Peacekeepers. 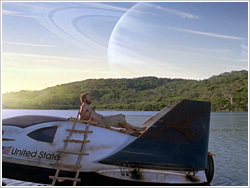 Once on the asteroid, the crew discovers an environment of lush vegetation inhabited by only two life forms. The crew must decide who is the predator and who is the prey between a female, M'Lee, and a large beast, Br'nee, both claiming to be the sole survivor of a massacre at the other's hands. As Moya and her crew search for a way to escape the asteroid field and Crais' watchful Command Carrier, Rygel flees Moya for the PeaceKeeper Command Carrier hoping to trade his own life for those of his shipmates. Meanwhile, back on Moya, her crew devises a plan to escape from the asteroid field but a series of unforeseen events threaten not only the success of our heroes' escape, but their very lives as well.